If anyone was passing through Moab, UT on Saturday and noticed a 17 year old girl with down syndrome dancing to the band playing in the parking lot on the main drag and high fiving everyone around her….that was Alex. Or adventure girl as I call her. When Alex was little I was concerned we would be unable to go on spur of the moment excursions. This turned out to be one of the many stupid things I worried about. My fear was Alex would require too much attention and supervision. I feared taking Alex anywhere would inhibit our ability to be spontaneous. I was very wrong, in many ways Alex enhances our time away. John and I decided at the last minute to get away this past weekend. 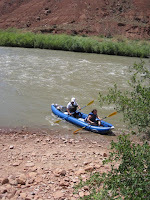 I had never been to Moab, so we packed the car, loaded the inflatable kayak and asked our kids to come. Needles to say, our 18 year old daughter and almost 15 year old son had way too much going on to join. Not so with Alex. Alex packed up in a jiffy, and is a great packer; I never double check her luggage. She included her PJs, toiletry bag, bathing suit and clean underwear. She also included DVDs, books and her PSP for the ride. She did neglect to remember her hiking shoes (on purpose I am sure); lucky for her I remembered them! 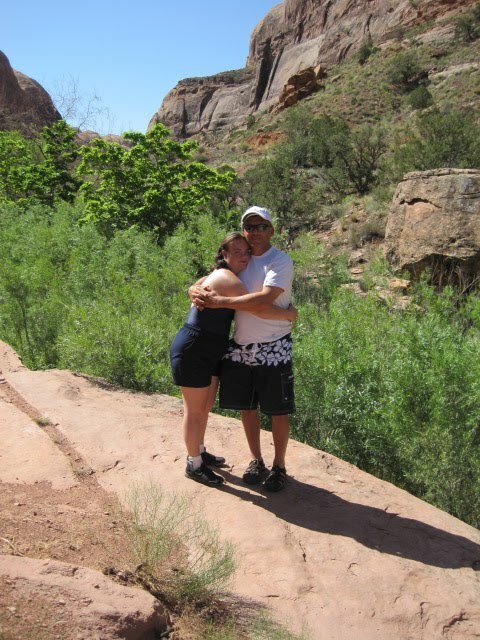 Alex still does not like hiking, so that is always a consideration when we travel. We usually have to bribe her with something great at the end; the first afternoon it was swimming. 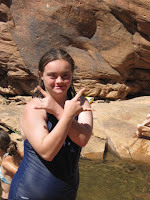 Getting to this particular swim involved a short hike and a climb down a thirty foot rock outcropping. Alex had no problems, despite her pink crocs. I may pack shoes, but actually getting them on Alex’s feet can be a challenge. That evening as we returned from dinner we drove by the benefit for “Raft for the Cure”. Open to everyone with live music – and an invitation for Alex and John to dance the night away. I am so thankful John has gotten a dancing partner in Alex. My dislike of dancing was not passed on to Alex, but she did get John’s love for boogying. Alex made friends on the dance floor, including a cute boy. The smiles of her fellow dancers and other non participants (like me) were noticeable. Alex and John enjoyed almost 2 hours of this revelry, and I enjoyed watching. It was a great evening and the feeling of nostalgia that my other two were growing up and did not want to join us was bittersweet. 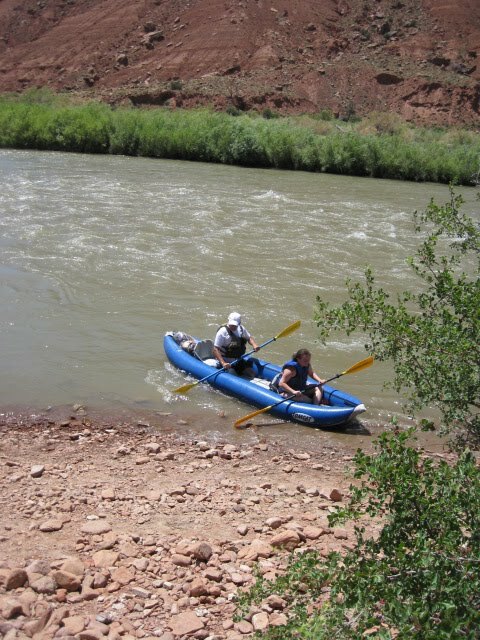 On Sunday we blew up the kayak and headed to the river. We lazed down the river for the afternoon, stopped for a picnic lunch, and swam. Although foiled by a dead car battery (thanks Courtney!) we were home by seven that evening. I realized I loved my weekend with Alex and John. Yes, I wish Courtney and Tom had come, but I understand they are growing up and away from us. I know I will always miss them, but they are turning in to their own independent people. Sad, but true; I am proud and happy for them. As much as I wish for Alex to have the same future as Courtney and Tom I am glad she came with us. I do not want to be in my seventies, always vacationing with my disabled adult child, but I do not want Alex to leave us for a few years. We will be ready for Alex’s future soon enough, so why rush it? My sentiments for at least this week , but who knows next week I may feel differently. One thing I will always know; Alex is our adventure girl! Parade city! Seems we have a host of those posts! Too funny! Sounds like quite an adventure! I'm glad Alex was excited about joining you. Beth is just the opposite, wants to stay home. You do have an adventurous girl! Sounds like a great weekend! We went to Moab when I was pregnant and hiked. I didn't get to do as much as I wanted and am hoping we get back there soon.